I grew up passing this photo in my Aunt Susan’s hallway. It was next to images of my Great Grandfather, Joseph Gershenson, conducting orchestras and working with other musicians. 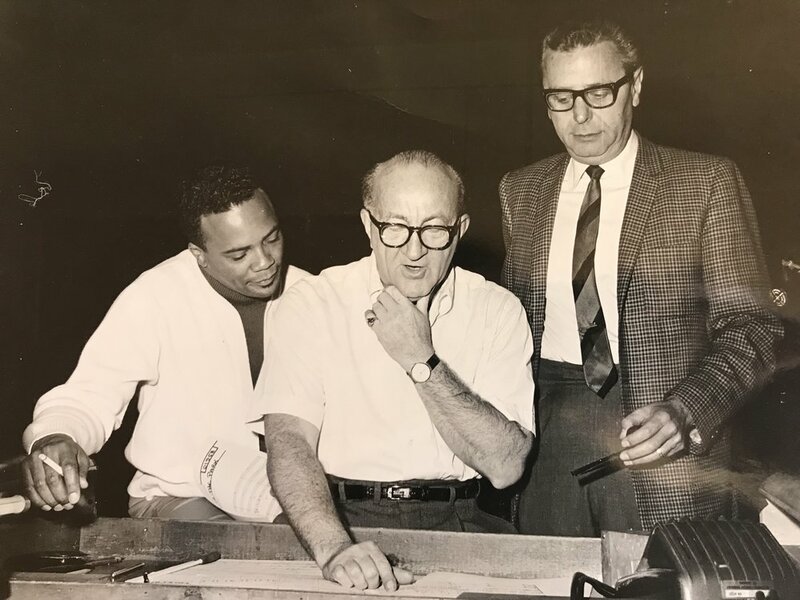 This image was in the company of other glimpses behind the scenes of Universal Pictures, where my Great Grandpa was Music Supervisor from 1940-69. “Dad gave Quincy Jones his first big break,” Grandma Lilly would say. I first read my Great Grandfather’s oral history while gathering research for a dance history paper on vaudeville in college. About half way through the black binder I read, “I saw a picture called The Pawnbroker, which he [Quincy Jones] had done in New York, and I liked it. And that was the whole basis of my picking Quincy for Mirage.” Sitting in the library at Bard College I thought, oh ok, there’s that story. I still did not fully understand the lineage that Mr. Jones came from and the circumference of his influence on todays music industry. I continued researching Gershenson’s life and work. In 2015 I choreographed a dance using twelve different 1950’s film scores he supervised. As the research continued, I found myself circling back to the early 1930s when technology for Talkies developed and Vaudeville performers and music supervisors were out of work. In 1933 Gershenson and his best friend Milton Schwarzwald founded Mentone Productions and produced seventy-eight shorts. The ten minute shorts showcased acrobats, contortionists, opera singers, dancers and musicians. Schwarzwald and Gershenson were excited to take advantage of the up and coming distribution technology of the moving audio picture. These top notch Vaudeville acts were screened as previews, at cinema intermissions and broadcast on the radio. Although Grandma Lilly insisted that all the shorts were “gone,” I found twelve of them thanks to youtube user rpf16mm who posted two days before my third crack at the search. I recently found a clip of one of these shorts on a Carnival Cinema, an Australian online circus magazine with 549K views. In 2016 I took audio from these shorts and choreographed another dance piece. As the momentum of these works continued, the research on my Great Grandfather began to feel more like a collaboration with him. I began to seek out conversations with artists who worked with him. I wanted to know more about what he was like as a person and as an artist. I reached out to Carol Kaye, a bass guitarist who was a studio musician at Universal among other places. We had a fast paced hour-long conversation on the phone in which I was schooled on Click Tracks and got a taste of the life of studio musicians in the 1950s-60s. I spent a few years considering the idea of contacting Quincy Jones but felt hesitant and shy. An assistant asked me to send my resumé and about a month later someone from Quincy Jones Productions called me to set up a meeting. I started reading his autobiography immediately. A hug and kiss on the cheek. HW: Wicks actually, yeah I’m Helen Wicks, it’s an honor to meet you. HW: Great-Granddaughter. Yeah, I never met him. QJ: What are your roots, Eastern European? Jewish? QJ: [Takes a step back to really look at me] And how old are you? HW: I’ll be twenty-six next week. Gemini! QJ: Oh! I’m Pisces, I studied astrology for tewnty years. I had the best teacher... And onwards we talked as we went inside off the Bel Air patio. A wooden table between us, face to face. A soft couch, sitting side by side. A coffee table with, ‘The best cheese in the world. From France.’ With grapes and crackers and jicama. I made Mr. Jones a cracker and it crumbled in my hands and I froze as if I had never put cheese on a cracker before in my life. Don’t worry about it just get a new one. Can I offer you a drink? What would I say? What kind of drink would I have? Would I want to drink during this meeting? Ok, I’ll say I’ll have what you’re having. When we got settled on the couch he said something along the lines of, ‘I stopped drinking two years ago. Can I get you anything?’ He drank sparkly water out of a straw, I drank from my water bottle. Once we started talking my adrenaline induced dry mouth calmed as the conversation continued and I sunk into the couch and began to chill with Q. He was relaxed and it was infectious but his mind communicated in rapid fire. We started twisting and turning all over conversation. We would sit down and I would pull out my questions and ask the first one. What was your first impression of Joe? We talked for at least thirty minutes before coming close to why I was there: to learn more about the Great Grandfather I never met. We talked about love, inspiration, passion, and training. We talked about the role relationships play in learning and growing. He described love to be an instantaneous undeniable charge. Stories of my Great Grandfather would pour out of him. In his oral history Gershenson said, “I saw a picture called The Pawnbroker which he [Jones] had done in New York and liked it and that was the whole basis of my picking Quincy for Mirage.” Can you tell me about The Pawnbroker? Jones explained that at the time of The Pawnbroker he had an agent who would not let him work on “B” films. Only “A” films. Pawnbroker was an “A” film. In hindsight he was glad for the strategy as it lead to him working at Universal. Did you feel prepared for the opportunity at Universal? He had been for years. His teacher Clark Terry had stopped playing with Duke Ellington to play in Jones’ touring band around Europe! He went on talking about the lack of opportunity given to him as a black man in America. In America he wasn’t ever given the opportunity to compose for strings. It was not like he didn’t know how to compose for strings, just that no one ever let him do it! Strings were for white musicians. In France, while studying with Nadia Boulanger who also taught Stravinsky among others, he finally got to compose for strings. He went crazy with it and joked that he put strings around the hallway, down the stairs, and onto the sidewalk. What would you do with this book Joe wrote but never published, Music for Films: A Guide to the Techniques and Procedures Involved in Writing and Development of a Motion Picture Score. He said he got chills when I brought out that book. As he looked through the Table of Contents he read: “Composers’ Sketches.” Listed are names of composers Joe worked with and included in the book: Jerome Moross, Frank Skinner, Johnny Williams, Alex North, Quincy Jones, Henry Mancini, Lalo Schiffrin... and the list goes on. Jones said something like, ‘Oh my god, that’s me! Look at these cats these are all the greats.’ He voice was giddy and surprised – excited to have been included on the list. How do you deal and engage with your inner critic? Ralph Ellison said that you are “a fearless explorer of the territory.” How do you relate to that? Does it feel fearless? We talked about the importance of staying positive. But how? I inquired about strategies or practices to keep negativity out, in order to keep the channels open. He articulated the importance of keeping your soul open. In reference to his song Soul Bossa Nova (which he referred to like real estate – it just keeps appreciating in value) he just let it out straight from his soul. But how? He asked me if I’ve ever heard of affirmations? He does them three times a day. And into an affirmation prayer he took us. I listened to his voice with my whole body. Did Joe ever tell you that what you composed wasn’t right? How’d he do it? Jones never had an experience like this with Gershenson. He wrote ten scores for every one score. If they didn’t like one he would have another to hand right over. Would you consider Joe more artist or more business man? How do you think he identified himself? How do you identify yourself? I learned that my Great Grandpa was an executive. He was the boss. He knew what was needed and how to get it done. He held many threads together and oversaw many things. Did you ever hear Joe speak Yiddish in Hollywood? What was your experience of Jewish and African American relations in Hollywood? What? He readjusted his posture to sit more upright. I rephrased: From your perspective, what were the relations between Jewish and African American musicians and artists in Hollywood? After a pause, I remember a simple answer: There was some racism. Did you ever party with Joe or hang out outside of work? He was very much the boss. The two never saw each other outside of the studio. Did you ever meet Joe’s wife Helen? It was wild to read about your brain surgeries! How have you witnessed technology and the internet change the music industry? You knew about Bill Gates and the internet. How did you stay relevant as the internet changed music? Do you know how adaptable Joe was to new technology? Our conversation turned to the younger generations and their increasing brilliance. We debated whether the internet is making people smarter or more lazy. I remember him saying that he read the Qur'an first when he was thirteen. I asked: How’d you find it? He couldn’t tell me but he sought it out and seemed to believe that you seek out what you need. What happened to a project you mentioned with Cirque du Soleil and the history of black music? We were going to do a show on the history of black music then they said they wouldn’t want a black show in Las Vegas. If the conversation loses momentum and we are silent for a moment, he will end the meeting. What do you believe art strives for? In your autobiography you describe the five elements, according to your teacher Nadia Boulanger, to be: “Sensation, feeling, belief, attachment, knowledge.” How do you think about it now? Well, good to meet you! Bye! After three and a half hours, cheese and crackers for dinner, our conversation transitioned into silently inscribing notes in the books we gifts each other. Before I leave can we get a pic together? I am grateful for the lineage that lead to this conversation. Thank you, Great Grandpa Joe. Thank you Mr. Jones, for the stories, and the incredibly humbling and inspiring hang. "I do this to liberate myself at being good at this. I can allow the richness of the dance if I just let go of what is happening."